Note: Chefs Massimiliano Blasone and Marco Calenzo have now left the restaurant. Consequently this blog post may not reflect the current state of affairs at Apsleys. Apsleys, the one Michelin starred Italian restaurant located in the Lanesborough Hotel, kindly invited me back to try their new spring menu. I went to Apsleys about six months ago for what was my second visit and had a glorious meal (for that blog post click here) and it was such an honour to be asked back again. At the helm is Executive chef Massimiliano Blasone, Sous chef Marco Calenzo, and restaurant manager Pasquale Cosmai. Apsleys is the sister restaurant to Heinz Beck’s three Michelin starred La Pergola in Rome. 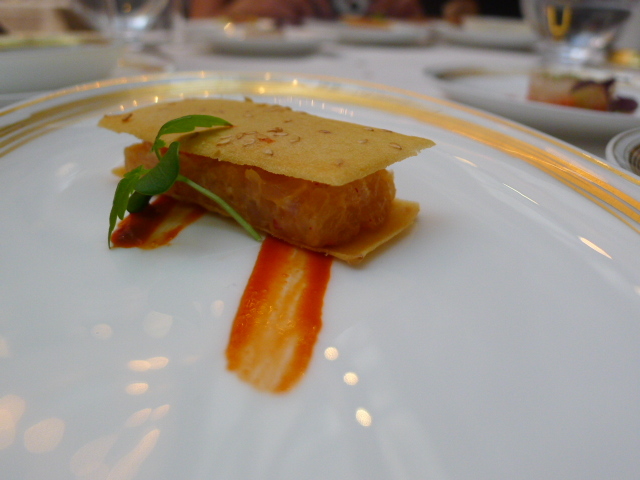 We kicked the meal off with a wonderful selection of amuse bouches that thrilled. Kingfish sandwiched in sesame ‘waffles’ was a delight, with the wafer-thin texture of the buttery waffles contrasting well with the fish. A trio of aubergine, blue fin tuna and pomelo was lovely and light. The aubergine, smoked and then cooked in tuna stock, miso and aged balsamic, was particularly complex and intriguing in flavour. 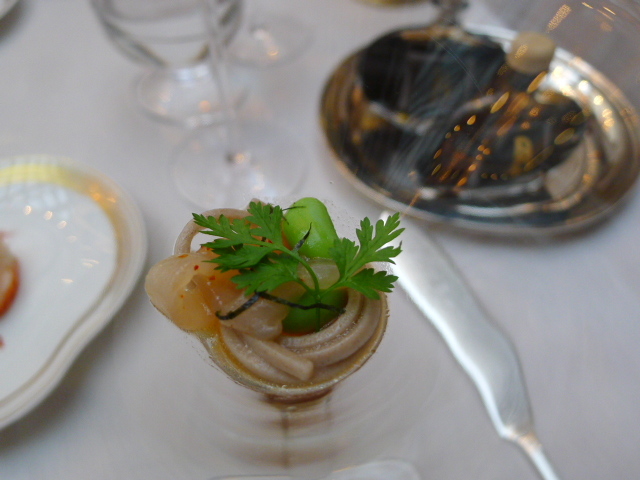 Layers of brunoise-chopped seabass, papaya and cucumber provided a heady contrast of textures and flavours, and a martini-glass serving of cold buckwheat spaghetti with mackerel and soya beans was wonderfully aromatic from its dressing of fish consommé, ginger and soy sauce. Apsleys prepared a selection of dishes from the spring à la carte menu for us to try, and the prices, where listed below, are the à la carte prices. 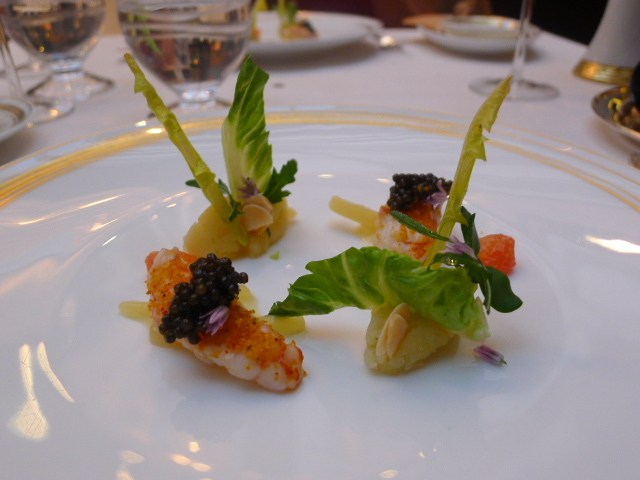 The first course, a langoustine with Sturia “Prestige” caviar, fennel and grapefruit (£50.00), was the highlight dish of the evening. The langostines were exquisite, and their winning flavour lingered deliciously on the palate. 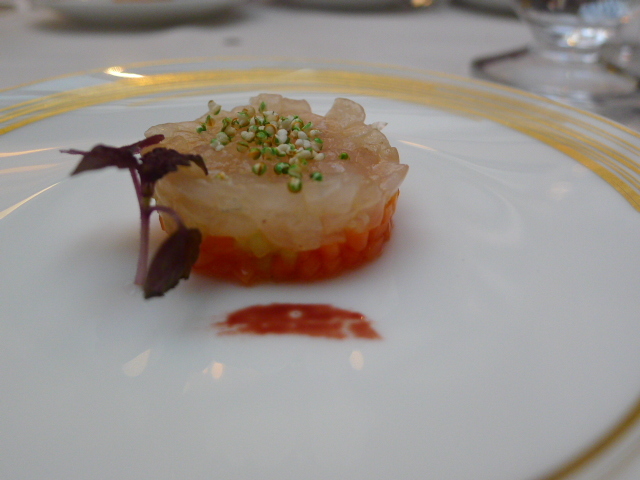 The decadence of the caviar served to enhance the sweetness of the shellfish, and the grapefruit, both sweet and acidic, provided a nice counterpoint to the dish. The fennel added a further earthiness to the mix, which in itself had a lovely sweet flavour. 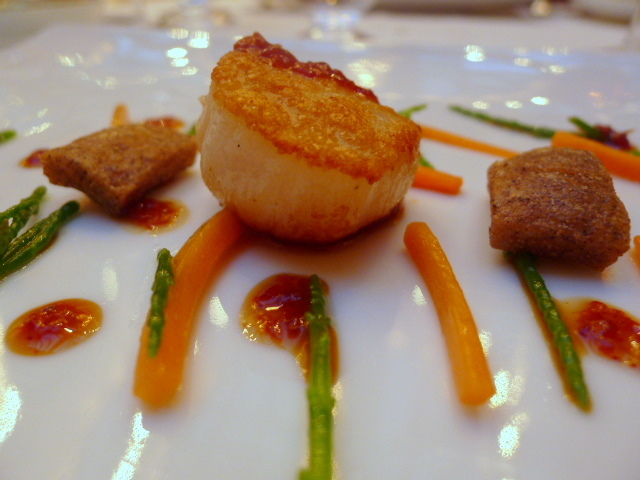 Sea scallops were served on slices of crescentine, a Tuscan crisp bread, which provided a crunchy contrast to the soft scallops. 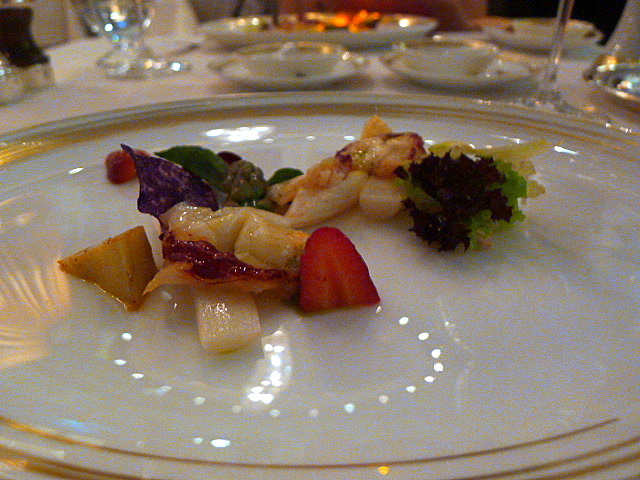 It was accompanied by a sweet chilli vinaigrette which was nicely balanced between sweet and hot. 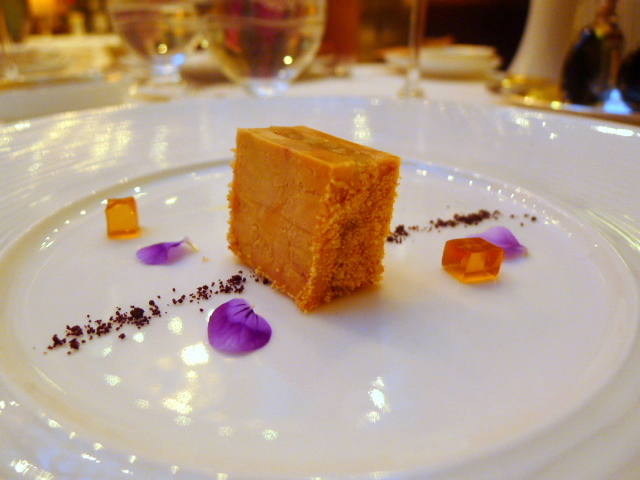 Foie gras terrine with smoked apple and a drizzling of amaretti powder (£25.00) was a delight. The terrine was dreamy, and the hints of smokiness in the sweet apples worked a treat with the terrine. The apples themselves were perfectly cooked – tender but also with a little bite. 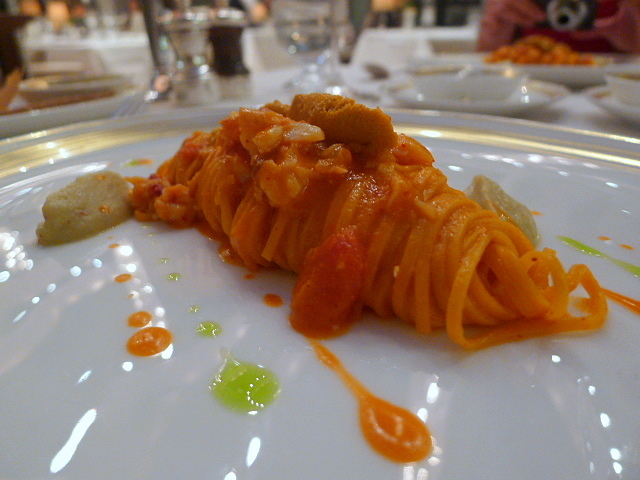 Tagliolini was served with meaty lobster pieces and a Trapanese pesto made with Sicilian Noto almonds and Pachino cherry tomatoes (£22.00). The way in which the al dente pasta had been twirled was masterful as it was not only visually attractive, but also because it ensured that each bite of pasta tasted perfectly aligned in your mouth. The dish was finished with some sea urchin (served only if available). Wild garlic risotto with albacore (white tuna) was next (£21.00). This was quite an amazing dish for instead of stock, the risotto was made with a ‘tomato water’, a liquid derived by blitzing Sardinian camone tomatoes and straining them overnight. These tomatoes are known for their sweetness and acidity which was evident in the risotto, and there was a wonderful subtleness coming through from the hints of garlic. The lobster in a lobster salad with white asparagus, artichokes and strawberries (£30.00) was exquisitely sweet, and the asparagus and artichokes had a nice fresh crunchiness to them, but I was unconvinced by the use of strawberries in the dish. 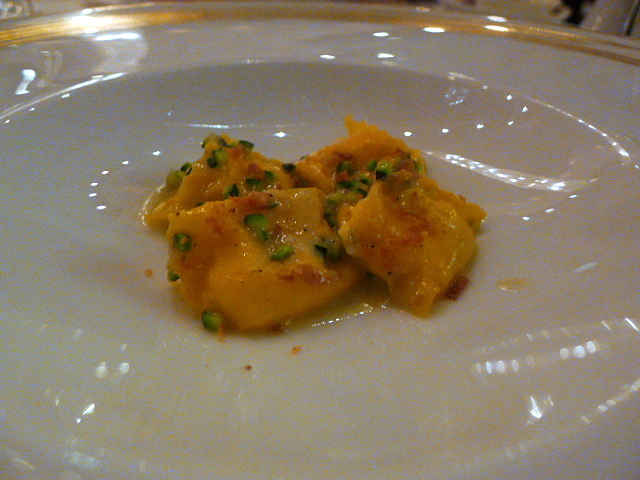 The carbonara fagotelli is the signature dish at Apsleys and when I was blown away the first time I had this. The carbonara filling was again lovely and light, but a little saltier than last time. 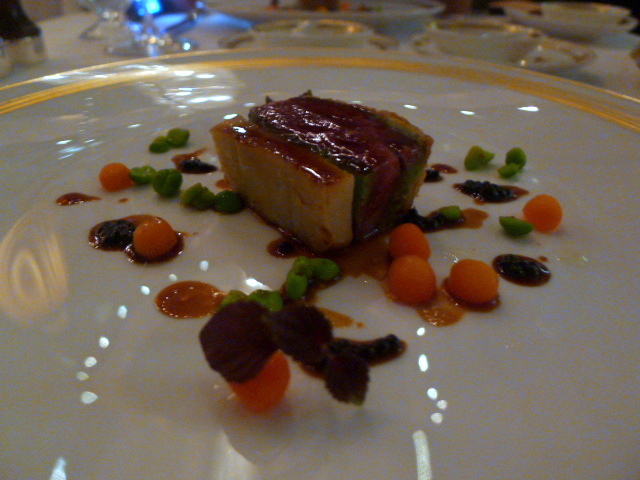 Pigeon wrapped in puff pastry (£36.00) was cooked to a tender, succulent perfection. It was served with artichoke hearts, and a sweet and sharp mustard seed sauce made with a balsamic and apple juice reduction that matched well with the pigeon. 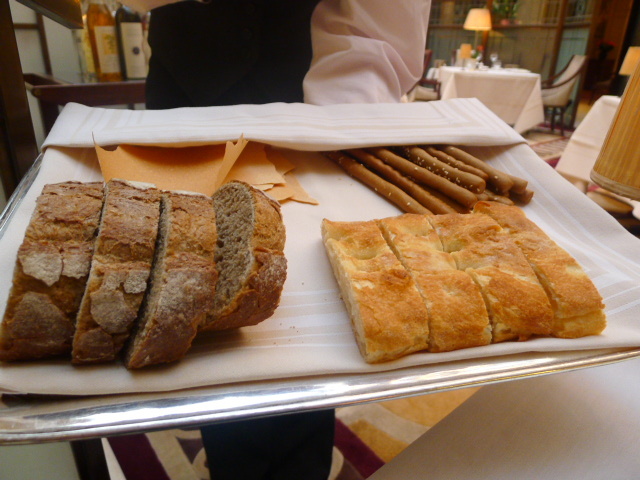 The bread selection included brown bread, focaccia, grisinni and strega. All were well made, with the brown bread giving way to a crunchy crust and a soft fluffy centre, and the strega providing a crispy crackle. 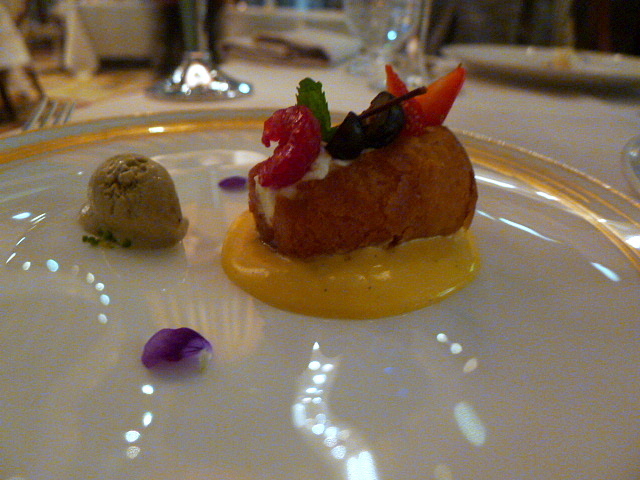 A pre-dessert of rum baba was served with a pistacchio di Bronte ice cream, the highly prized Sicilian nut. After this was our first dessert, a ‘white dream’, so named as such as it contained a white chocolate ball with frozen meringue, passion fruit and lime. 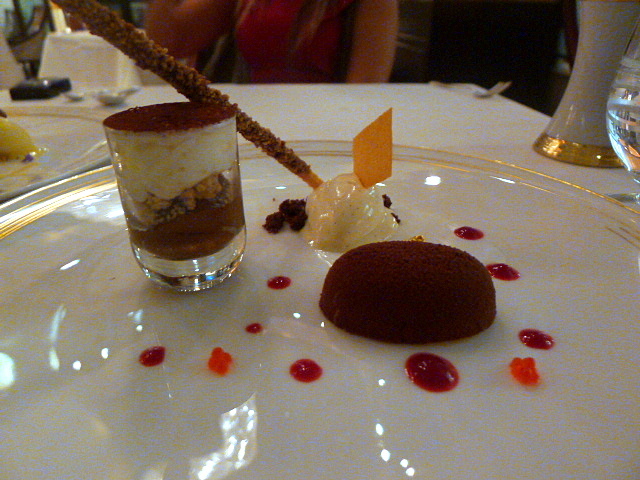 Served with a pineapple sorbet, the combination of zingy fruit and crunchy meringue was particularly appetising. For something a little darker in colour, we tasted a ‘coffee surprise’ of mascarpone fondant, vanilla ice cream and amaretto Mikado. 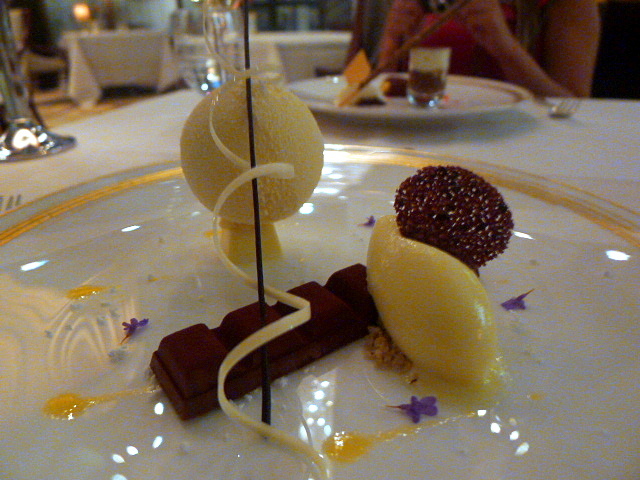 The creamy rich layers of marscarpone, ice cream and Mikado were heavenly. This was yet another resplendent meal. What was evident was the respect placed on the fresh, quality ingredients so as to extract maximum flavour. The seeming simplicity of the construction of the dishes belies a certain complexity. 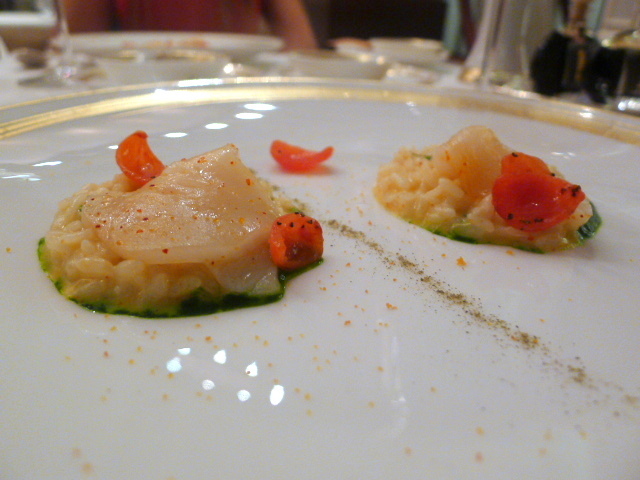 The amuse bouches thrilled, as did the langoustine dish. Thanks to the team at Apsleys for a lovely evening. 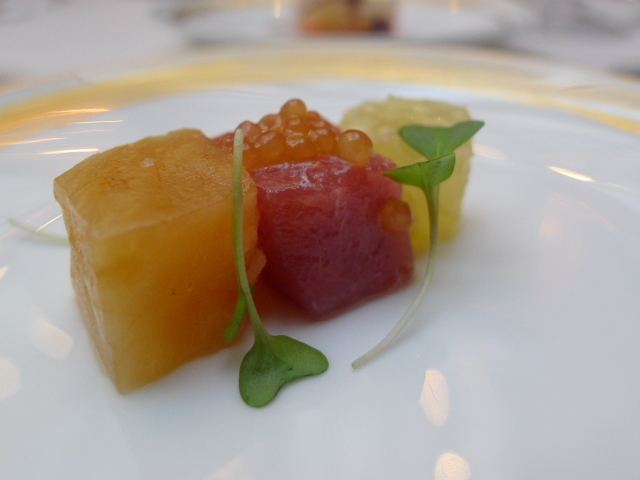 Price range: Three courses (including the caviar options) – £59 to £104. Five course and seven course menu – £65 and £85 respectively. Excludes drinks and service. Great write up. Went last month and had most of the dishes you tried this time around. Was left very impressed but baffled as to why this is not 2* worthy when places like I dont know L’atelier is. Yes I think this restaurant is excellent and deserves consideration for a second star. Yep definitely enjoying going to this place. btw you forgot the petit fours that we ravenously ate! Hmm.. glad to see your experiences improved.. I’m due to visit for a Valentine’s Day dinner, and the various reviews were making me quite nervous.. any last thoughts on the food?